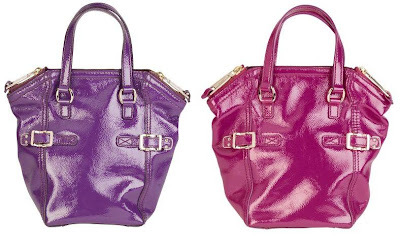 There is nothing better than a bright jewel tone bag candy to cheer a gal up anytime of the year. After setting my eyes on these mini YSL Downtown totes, I fairly drooled on them in the boutique. They are just so eye catching, modern and stylish. Any of these will be a refreshing addition to any bag collection. Although being a pink gal, SG is partial to lilac and begonia. These lovelies will be a perfect accent for my outfits this fall/winter or coming spring/summer. As I have a YSL Downtown in medium, I can attest to the ease of use. There is a small patch pocket inside which is good for keys and cell phone. My long wallet is too big to fit inside the pocket. These mini totes measure 10"h x 9"w (at the widest point) x 5"d (but 5.5"w at base) maybe a little small for a carryall bag (ie. snack, change of clothes and sippy cups). However, there is plenty of room for my big wallet, keys, cell phone, make-up bag and some little necessities. This is a handheld tote; the double strap handles are too short to wear on the shoulder. 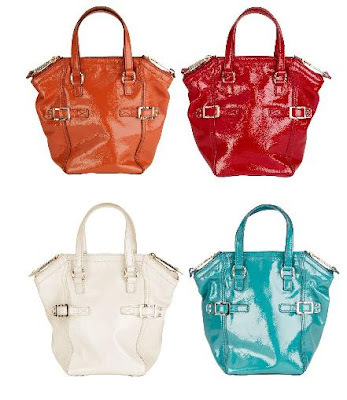 SG can't choose, I want every color. Black is available too, but who wants black with all these choices. Which is your favorite? Hi there-totally gorgeous and perfect for summer, I think I'd have the pink one!! i love the white one! add me! http://anhesty.blogspot.com thanks! Great bag!! I would probably go for the black one first. I have actually started to buy more colorful accent pieces lately, so that being said, I would probaly choose the red one. While I think that the purple one is fun, it's a little too out there for Miss-Always-Wears-Black, Me. I love all the vibrant colors! Cute tote! Lush bright colours, the shimmery aqua is my favourite. I never spend that much money on something that isn't black. I am a black bag gal. I love the bags. How much did you pay for yours? I think grey, black or brown for such an expensive bag, since I would want it to last. However, I love the pink! i love the magenta-y pink one!! I also want one in every bright colour, please. Ooh, I'm always overwhelmed when faced with a rainbow of colors. So hard to pick one! The pink is beautiful but I have a pink bag so I'd go for...orange! Or purple! Or red! Oh no, I can't decide. I'd love the acid blue! These are cute--I love the bright colors! i'm really liking the white one. it would be perfect for summer. Great bag! I love the punchy jewel tones for spring/summer. I think the begonia one is my favorite. ohhh a mini! I want one! so cute!